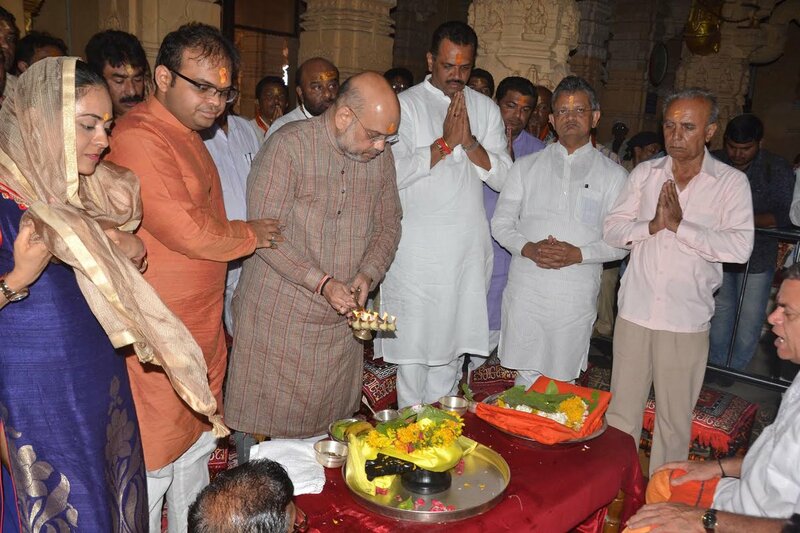 Somnath: National president of ruling Bharatiya Janata Party(BJP) Amit Shah today performed puja at Shri Somnath mandir in Gir Somnath district of Gujarat. Shah was joined by his son Jay Shah, Jay’s wife and daughter in puja ceremony. State BJP president Jitu Vaghani, State organizational general secretary and RSS pracharak Bhikhubhai Dalsania, Lok Sabha MP Rajeshbhai Chudasama and number of BJP office bearers from party’s local unit were also present on this occasion. It should be mentioned here that today is the 68th Pran Pratishtha divas of Shri Somnath mandir. In 1951, on this day the Shivalinga of new temple of Somnath was installed by then president of India Shri Rajendra Prasad in presence of Kanaiyalal Munshi, Jam Saheb and others.